GCU was thrown into the NBA spotlight over the weekend as more than 150 dancers descended on the Student Recreation Center, each of them hoping to become a Phoenix Suns Dancer for the 2011-12 season. Because of its partnership with the Suns, GCU was approached about hosting the auditions in the new Arena, but the facility is more than a month from completion. The Rec Center was offered instead, and Kip Helt, the Suns’ vice president of game entertainment, couldn’t have been happier with the outcome. Jonnis leads Suns Dance Team audition choreography. 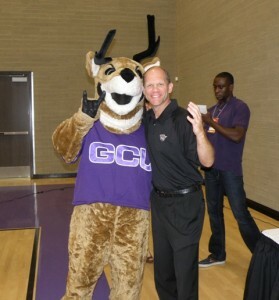 GCU’s mascot, Thunder, showed up to greet the dancers and give them hugs of encouragement. Celebrity choreographer Jonathon Tannis, who goes by the name of Jonnis, was brought in to teach the dancers the choreography they would use for their audition. He also was one of the judges. Jonnis was one of the finalists in the first season of “So You Think You Can Dance,” which airs on the Fox television network. The dancers, including one male, spent the morning learning the choreography. Then they were called up in groups of five, performing for the judges twice. Thunder poses with Vice President of Game Entertainment Kip Helt. Tryout Terah Lake knows all about the commitment required to be an NBA dancer. She spent six seasons as a dancer for the Memphis Grizzlies. She moved to Phoenix last year with her husband and two children and had been looking forward to trying out for the Suns’ dance team. Lake also was impressed with the GCU campus. Two rounds of cuts were made Saturday, and those who made the second cut were invited back to campus Sunday, when they participated in a photo shoot and interview and performed an original piece of their own to music they were given the night before. A third cut was made Sunday afternoon, and the survivors were invited to a training camp this week. The final audition and cut will take place at US Airways Center next Saturday. The team of 18 members will perform at games and events throughout the season. That’s assuming the NBA’s labor dispute is resolved and there is a season.